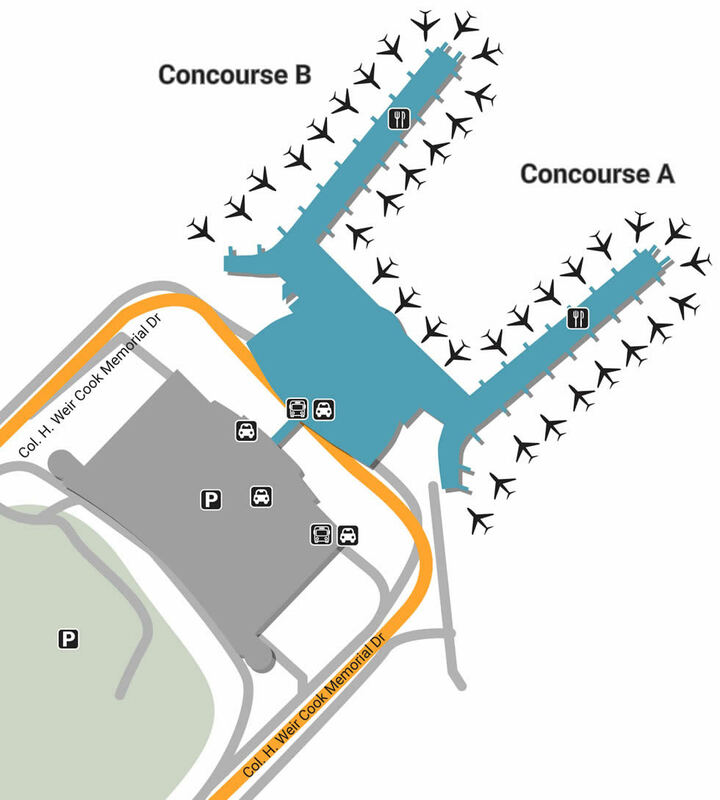 Vacationers needing to get to their flight quicker can use our basic maps of Indianapolis International Airport that can give them a better understanding of the layout. Located seven miles southwest of the capital, Indianapolis is a friendly city that perfectly mixes the old with the new. The Indianapolis International Airport is one of the most visited in the country as well as one of the most appreciated; appreciated for its cleanliness, beautiful design, and overall excellence in pleasing each guest like a star. Don’t get ahead of yourself before taking the necessary steps - plan ahead and save money by deciding where to park before you arrive. If convenience is most important to you, go for Valet Parking, located on Level 3 of the Terminal Garage. The garage has five floors total, offering a cool pedestrian breezeway that attaches directly to the terminal. For something a bit cheaper, but still close to the airport, utilize the Park & Walk program, which offers cheap daily parking for the trade of having to walk 8-9 minutes along an outdoor path. The Economy Lot is the most efficient route to go, offering thousands of spaces as well as free shuttle parking 24 hours a day. Countless adventures await outside the doors of the airport, but just as many subtle surprises await inside. The airport is home to three Nursing Mothers Rooms: one located in pre-security, another near Gate B5, and one more past Starbucks in Concourse A. There’s also an on-site barbershop past Civic Plaza’s Ticketing Hall named Hair Departure. The facility is proud to be health conscious, offering over a mile of trails through The American Heart Association Walking Paths as well as a Meditation Room. The airport also offers free Wi-Fi with a signal 10X stronger than most airports in the country. A great way to drop stress is to relax - do so through modest shopping. Check out the interesting women’s apparel from Robin Barre’s Artizan (A6) or pick up the latest cotton-quilted bag from Vera Bradley next-door. Dip into the local auto-racing culture by picking up a special souvenir at Brickyard Authentics (Civic Plaza) or go even further by nabbing some college swag at Hoosier Marketplace. If all your craving is a snack that’s out of this world, pop into Just Pop In! for some local gourmet popcorn that makes for a perfect gift. Whether you’re staying longer or leaving sooner than expected, picking up something special only takes a second. Get your filling at the classic 96th Street Steakburgers, home to a menu that’s short, but perfect for on-the-go tasters. It doesn’t take long to see the people of Indianapolis are very serious about their racecar driving, especially when you walk past Indianapolis 500 Grill (Civic Plaza), a race-themed diner open for breakfast, lunch, and dinner. Push your intrigue of local flavors to the limits by stopping by King David Dogs (B16), a beloved personalized hotdog shop, afterward perusing the do-it-yourself salad & sandwich bar of Camden Food Co. (B5).